Today, I'm super pumped to share a favorite yoga sequence of mine with you. I'm headed to the beach today for a long weekend, but that's no reason to slack on the exercise. I plan on doing this exact sequence every morning and evening while I'm on my beach trip. Exhale. Bend forward from the waist into forward fold, go as far as is available. Bending your knees if you need to do so is perfectly acceptable. Exhale. Place your hands on the mat, step back right foot bending your left knee. Keep your chest lifted and gaze forward. Exhale. Lift your hips up, pressing them back, into downward facing dog. Try to think of yourself as pushing your chest in between your legs. Exhale. Come up slowly back into mountain pose. You can also move your hands to heart center if you like. Repeat this sequence, on the other side (stepping back with your left foot). I like to do 3-5 sets meaning, I will complete this sequence 6-10 times. Remember, it's important to perform these poses with fluid movement keyed to your breath. Focusing on your breath keeps you present and helps you stay in tune with what your body is telling you! Wow! You're doing awesome! You're so close. Can't wait to see how many miles you actually get in if you keep going! Hi Jessica, just stumbled upon your lovely blog. Looove this yoga sequence! We always start off with this sequence in our yoga class. I see that you only have 2 more miles!!! Yay! Enjoy your weekend at the beach! 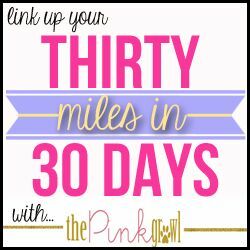 Found your blog through the Pink Growl's 30 Miles in 30 Days Link Up - I'm so excited about the Yoga Journal site and will be using it! Thanks for sharing! You're so close to your 30 miles - great job! !